To be honest, I’m not the biggest doughnut fan. I regularly pass when offered one. It’s just not my thing, not even those straight off the conveyer belt at Krispy Kreme, whose hot light seems to make people lose all the sense the good lord gave them. I have a friend who will actually swerve off the road at the sight of that neon sign. People seem to be in love with the things, but I’ve just never cared for them. 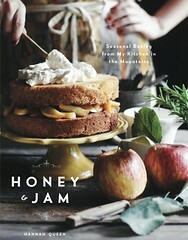 So, when I saw this recipe on The Pioneer Woman, I was intrigued. Maybe I would like them more if I made them at home? And you know what? I do. But I have to say you need to go into it without your preconceptions, because these don’t taste much like Krispy Kremes at all. They are just a bit more dense (but not much), and definitely not as sweet. This was...an experience. I’m not going to tell you it was easy, because it’s not, it's messy and labor intensive, but it's also a lot of fun and a great way to spend a Saturday when you’re completely snowed in! 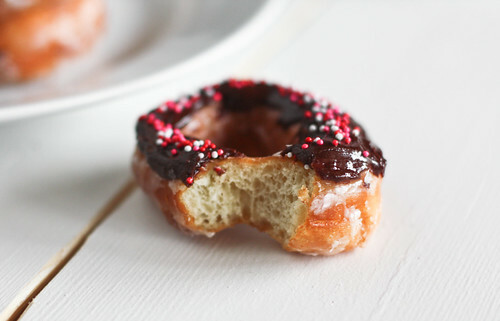 I spiced mine up with a chocolate glaze and some sprinkles, I think a maple glaze would be good too. I love that about these, you can customize them any way you want. I’d love to try jelly filled next. 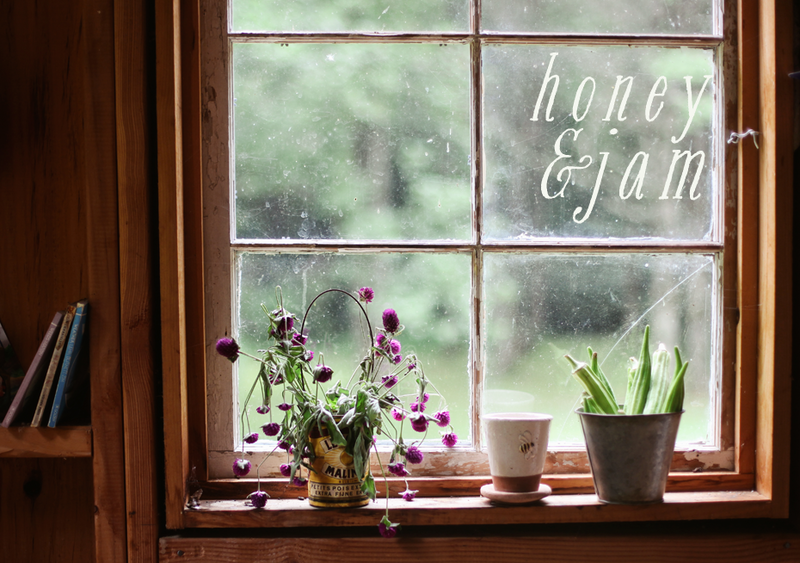 From The Pioneer Woman, check out her site for very helpful step by step photos. 4. Serve warm if possible, or room temperature. Your donuts turned out so pretty. I love how delicate they look. These look great! Thanks for the laugh too...the mental picture of your friend veering off the road for KK...it really cracked me up! Sweet action! they are beautiful! Your doughnuts are beautiful! I don't particularly like doughnuts either, but I'll bet homemade are delicious. Maple glaze DOES sound good. My mom used to make doughnuts when I was a kid - YUM. My grandma handed down this recipe for potato doughnuts that made the biggest batch ever (don't start without reading recipe first). My mom and I made them were handing out doughnuts to everyone we knew, they were good, but since the recipe was written for a church breakfast it made hundreds! I'm not a big doughnut fan, but Mr Chiots sure is. I'll have to give these a shot. I've never really liked doughnut much either, but I might have to try these now; coming from another un-doughnut person! We need to get you a box of Sublime doughnuts from downtown one of these days! I think you'll like them. Soft, fluffy and not too sweet! They look absolutely divine! I have grown up with home-made doughnuts and I have to say that home-made just trump everything else! Awesome job! And I just love the sprinkles! I agree. I don't like the chain doughnuts. But there's something about homemade. They look incredible! I've never tried making donuts at home! I'd like to try it someday. I don't love donuts either, but I am intrigued about trying them at home. I’m sure I wouldn’t be able to stop eating these! Yum! Pioneer Woman is always good for a few good eats. Also, your header contains what might be the coolest tea cup ever. I saw this recipe on PW, too, but (1) I'm vegan, and (2) I don't make fried foods for my family. Then I remembered these apple cider doughnuts I used to get at an apple orchard years ago and couldn't stop thinking about them! So I made baked apple cider doughnuts, and they turned out really really good - better than what I remember getting from the orchard, actually. I loved watching my toddler eat her first doughnut, on V-day no less. When I saw them on Pioneer women, I so wanted to make them too. how I love the way these turned out! I could see these being labor intensive, considering the steps involved, but well worth it!! Oh I do love homemade doughnuts!! 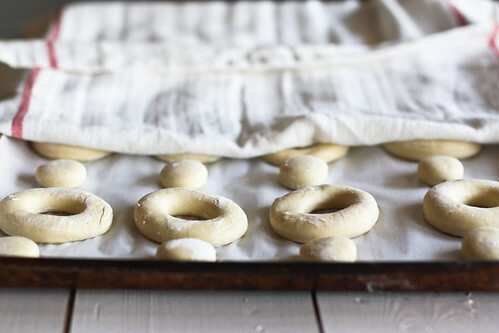 Mmmm wow these look delicious, ive always wanted to try making homemade doughnuts!! So many goodies I wanna try to make. Doughnuts are on a list too! :) These look scrumptious! You know, I've made donuts too, and they aren't always worth all the mess - not that yours don't look adorable! My favorite "cheat" has to be the baked donuts at 101 Cookbooks - much easier, very light, and zero frying! Nice! The glaze really makes them look fantastic! Waouh! Wonderful! So beautiful... I have already had breakfast but... sigh... 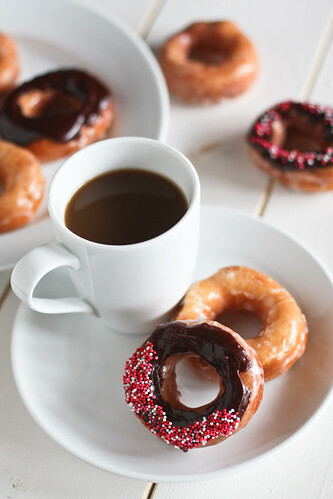 I am hungry again... those donuts are so mouth-watering! I love doughnuts, and making them. I happen to reside in the northeast, and we don't have the super sweet Krispy Kremes (they tried and failed to stay here), and instead have another monster chain, who has much better doughnuts (in my humble opinion). I made raised doughnuts once, and they didn't come out so well, so I think I need to try this recipe next. These look fabulous. I haven't tried to make doughnuts yet, and am not sure I'm ready, but when I am, I know where to come. I'm one of those crazies who will swerve off the road if I spy a KK, but only if my "lose weight" New Year's resolution isn't weighing on me. Yours look lovely! I've made doughnuts before but not this method. Thanks for the lovely post! I love it when you wrote, "whose hot light seems to make people lose all the sense the good [L]ord gave them." LOL HILARIOUS!! I'm not crazy about Krispy Kreme, b/c their doughnuts are too sugary (I prefer Shipley's Donuts YUM!). I think this recipe just might be the ticket then. I saw these on her page, too and was quite intrigued. I'm glad you tried these out first so I can get more of an idea of how they taste. Your doughnuts are BEAUTIFUL!! Wow. I didn't know doughnuts could look so gorgeous. 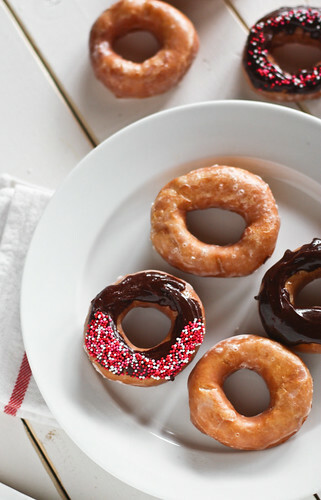 omg, i want to eat your donuts for dinner. It's me again. I wanted to let you know you have an award on my blog. Thanks again for your wonderful pictures. Oh gosh, we will definitely try this eventually... after we clear out the stash of Girl Scout cookies. im not a big doughnut fan myself, but those look irresistible! just lovely..